Want a luxury crossover in the mid-size segment? Good news, you're pretty much spoiled for choice. This is perhaps one of the most important segments in the automotive industry, and everyone wants a piece of the action. You've got the German Audi Q5, BMW X3, and Mercedes GLC, the Japanese Acura RDX and Lexus NX, the European Alfa Romeo Stelvio, Jaguar F-Pace, and Volvo XC60, and the American Cadillac CT5 and Lincoln MKC. So how can Buick possibly hope to stand out in this crowded segment with the 2019 Envision? 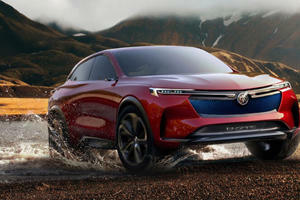 The Envision sits between the smaller Encore and larger Enclave, as Buick has settled with the letters 'E-N' to denote SUVs. 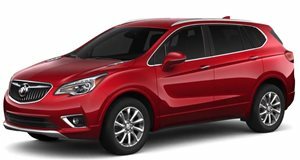 Buick has facelifted the Envision for 2019, and has . When I first sat down in the Envision, I couldn't for the life of me remember what car it was underneath. The Envision is built on the D2XX platform, which also underpins the Chevy Equinox and GMC Terrain. Some structural similarities can be detected on the inside, but the GM family resemblance is difficult to detect from the exterior. For 2019, Buick has given the Envision a nip tuck, successfully making it more handsome in the process. The 2019 features new optional LED headlights, LED taillights, and a more sculpted and chiseled rear end. The plastic surgery appears to be a success, as the Envision now looks quite handsome. The updates are far deeper than cosmetic, as the 2.0-liter turbocharged four-cylinder now sends power out to a nine-speed automatic that was co-developed with Ford. Power remains the same at 252 horsepower, but torque has been increased from 260 to 295 lb-ft - and boy oh boy the extra grunt is noticeable. The base car is propelled by a 2.5-liter four-cylinder mated to a six-speed automatic producing 197 horsepower, but the Premium II trim level shown here comes standard with the turbo engine and a twin-clutch all-wheel-drive with torque vectoring. Base engines are available with front-wheel-drive, but the turbo motor can only be had with AWD. Buick's AWD system is highly advanced, with the ability to send up to 100% of the power to the front or rear, or split the power evenly. I tested the car in Florida during the middle of the Summer, so there wasn't much opportunity to test the AWD's credibility in the snow, but the system felt incredibly planted and didn't become upset by puddles during Florida's massive rainstorms. With the more powerful turbo engine and AWD, the Envision attains below average fuel economy of 20/25/22 mpg city/highway/combined. In my heavy-footed week of driving, I averaged just over 21 mpg. These figures aren't terrible, just not class-leading by any stretch. It may not be the most efficient car in its class, but the added torque and new nine-speed have made the Envision much quicker. The sprint to 60 mph now takes 6.6 seconds, which is around half a second quicker than the 2018 model. Other changes for 2019 include new color options, in-cabin air ionizer, wireless phone charging, and an auto stop-start defeat switch. While I always appreciate the ability to turn off stop-start, the Buick system is one of the best on the market. Restarts are nearly imperceptible, and the system knows when you are crawling through traffic at slow speeds, so it won't activate every time you stop. The Buick really stands out against some of the SUVs I mentioned earlier based on price, because it represents one of the best values on the market. My tester was the top Premium II trim, which starts at $43,600. The Premium II comes extremely well-equipped with heated and cooled leather seats in the front and heated seats in the rear, memory driver seat, an eight-inch color driver instrument display, Bose seven-speaker audio, power rear tailgate, 19-inch wheels, LED headlights, automatic high-beam control, automatic parking assist, navigation with voice command, Android Auto and Apple CarPlay, and a 4G LTE WiFi hotspot. My tester also came equipped with the driver confidence package, which adds adaptive cruise control, automatic braking, and surround-view camera for $1,545, a panoramic moonroof for $1,495, and a few other options bringing the price up to $48,425 as-tested. The Envision features almost everything a modern driver could want for around $7,000 to $10,000 less than the equivalent Audi, BMW, or Mercedes. The nearly $10,000 price delta between the Envision and its German rival may be enough to persuade some buyers, but those who are looking for the prestige of a German marque may want to bite the bullet and opt for one of the pricier SUVs. There's nothing wrong with the way the Envision looks, in fact, I really like how it has been subtly redesigned for 2019. Still, it is hard for the Envision to compete with the pricier German models in regards to brand perception. Park next to the neighbor's brand-new German SUV, and your Buick will be quickly overshadowed. It is a similar story on the inside where the Envision just falls short. The interior is styled well and all of the materials feel upscale. The leather is subtle, unlike the diamond-hard stuff the Germans use, and there are almost no cheap spots throughout. It simply suffers from looking too derivative of other GM SUVs. GM went through the trouble of creating a different interior design language for the Equinox, Terrain, and Envision, but there are some details, like the infotainment system, that still feel connected. Buick's interface is called IntelliLink, and it functions similar to the Chevy and GMC MyLink that we've tested on both diesel version of the Equinox and Terrain. Touch response on the eight-inch screen is quick, and voice commands work like a charm. CarPlay and Android Auto are also there to make things even easier. My only complaint with IntelliLink is the cartoonish graphics that GM decided to use. Items like music are displayed using a highly stylized clef note, which looks like it belongs in Windows 98. I much prefer the cleaner look of Ford Sync. Looks aside, the eight-inch screen functions well, as does the eight-inch driver display. The Envision uses a large screen in place of a traditional speedometer, though there are physical gauges for the tachometer, engine temperature, and fuel. It looks interesting, but it seems like GM could have made things less difficult by making the whole cluster one big screen. Other controls are fairly easy to use, and I appreciate Buick's decision to include physical controls below the infotainment display. Buick made a less intelligent decision by making the temperature controls touch-sensitive. The controls for the cabin temperature and seat heating/ventilation are operated using resistive touch, and don't provide any haptic feedback. You have to blindly poke at them until they start to work, which is one of the Envision's lone ergonomic faults. The rest of the interior is smartly laid out, with clever storage pockets on the doors and above the glovebox. The wireless charger is also a cleverly located slot behind the shifter, which is easy to access. In terms of interior volume, the Envision is a bit of a mixed bag. Sitting in the front seats is perfectly comfortable, while sitting in the back is like riding in a limousine. The 108.3-inch wheelbase provides 37.5-inches of legroom for rear occupants. Even the middle seat is usable with no rear hump, and the rear bench can be slid forwards and backwards as well as reclined. I had passengers that were well over six feet tall telling me they had enough room to cross their legs and stretch out. Unfortunately, trunk space is a rather unimpressive 26.9 cubic feet, but does increase to 57.2 cubic feet with the rear seats folded flat. The Envision feels exactly how you'd expect a Buick to feel from behind the wheel: relaxing. The car glides over bumps with a well-damped suspension, though I feel the car would be a bit more comfortable without the massive 19-inch wheels. Steering is somewhat vague, but far from the lightest and least engaging SUV I've driven in this segment. All of the changes Buick has made for 2019 add up to make a big difference. The Envision is practically silent during the majority of driving. The nine-speed automatic shifts with the smoothness of a ballerina carrying a faberge egg, and keeps the turbo-four right in its sweet spot. GM's 2.0-liter four-cylinder is a powerhouse of torque, making merging onto the highway and passing slower traffic a dottle. The nine-speed is quick to downshift, but rarely needs to thanks to all of that juicy torque. I regularly found myself passing and merging onto the highway while barely exceeding 2,000 rpms. This is what luxury motoring is meant to feel like: effortless. There is no sport mode, nor are there paddle shifters on the wheel. 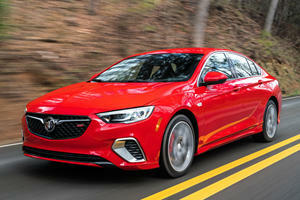 Buick did include a rocker switch on the shifter, though it is slow and should mainly be used to take advantage of the car's lackluster 1,500 pound towing capacity. It's refreshing to step into a luxury SUV dedicated on providing a quiet and comfort experience. Some SUVs feign some level of "sporty" flavor with aggressively tuned suspensions, sport modes, and paddle shifters, but Buick ignores all of this pomp and circumstance to focus on what really matters: luxury. From most angles, the Buick Envision comes out a winner, but there are a few little niggles holding it back. For starters, the Envision lacks the intangible whiff of prestige that comes along with pricer European rivals. 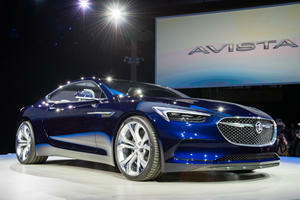 Buick makes up for it with an affordable $32,000 base price, which keeps it well below the price tag of its competitors. GM sold over 41,000 Envisions in 2017, but sales are down by around 6,000 units through the first half of 2018. This may be explained by the recent trade war between the US and China, which began after the US imposed a 25% tariff on Chinese-built cars. What does this all have to do with Buick? Well, GM manufactures the Envision in Yantai, China, and 96% of the car's parts come from China. Nothing has come of this yet, but Buick may be forced to either raise prices, or move Envision production somewhere else. Despite being a solid luxury SUV, the Envision's future may not be a vision of success. I ended up loving my time with the 2019 Buick Envision. It doesn't scream out "look at me, I make a lot of money," it just quietly goes about its business of being a comfortable luxury vehicle. If all you want is for people to notice your expensive new purchase, go ahead and look at one of the pricier German SUVs. If you want a ton of features at a reasonable price, the Envision may be more your speed. The 2019 Buick Envision earns a positive score of - Worth A Look. Just watch out for those tariffs. All that's left is the Regal. No successor is planned. Or could it be for something totally different? Remember, China is Buick's biggest market.